Marine retail dealer sentiment improved in October from the previous month and the mood also was more optimistic than in the same month last year. 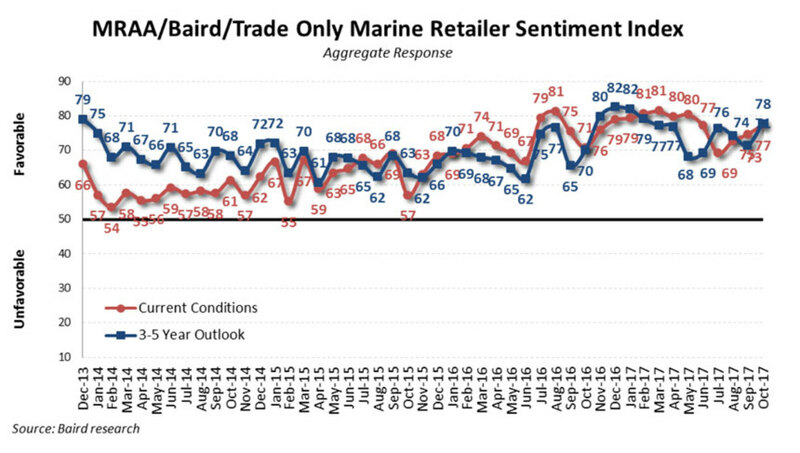 The MRAA/Baird/Trade Only Marine Retailer Sentiment Index rose to 77 in October from 75 in September and 71 in October a year earlier. The all-time high for the monthly index, which began in December of 2013, is 81. The 3-to-5-year outlook also improved, rising to 78 in October from 71 in September and 70 in October of 2016. Baird surveyed 78 dealers in October, which it said is a seasonally less relevant month. About 4 percent of annual retail boat sales occur during the month. 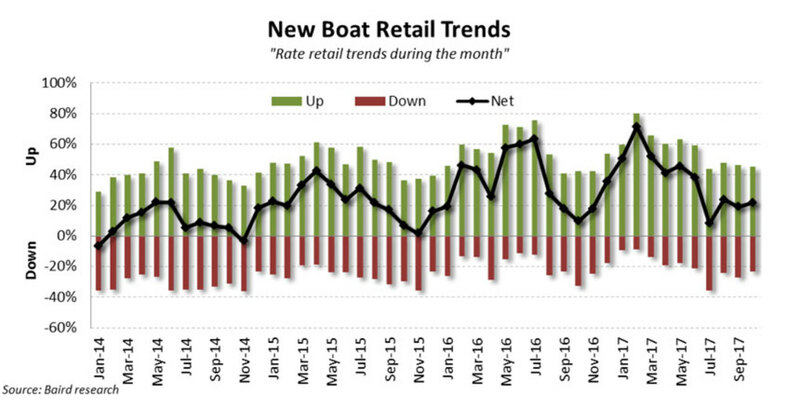 Baird said new-boat demand remained solid in October as 45 percent of the dealers reported growth in new-boat sales and only 23 percent reported a decline, compared with 27 percent in September. “Local and national economies are strong, gas prices and interest rates are relatively low,” another dealer said. “While hurricanes caused choppiness to recent retail data, our checks suggest sustained positive sentiment and a stable demand environment. … We still believe growing wealth among affluent consumers will support growing demand and that the lack of used supply will steer buyers toward new boats,” Baird said. 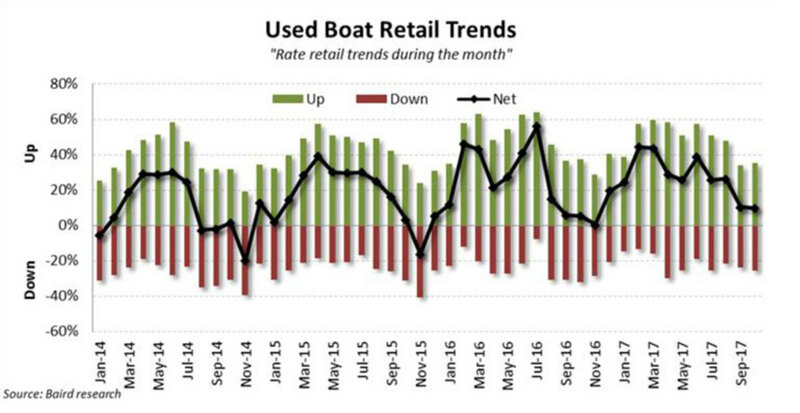 Baird said used-boat sales trends in October were consistent with those of September as 35 percent of dealers reported growth, compared with 34 percent in September and 37 percent in October of last year. Baird said used-boat inventory remains lean, but inventory levels have risen during the past few months. Forty-seven percent of dealers said used-boat inventory is too low and only 19 percent said it is too high. Retailers indicated that the economy, access to credit, new products, trade-in activity and OEM promotions positively affected demand in October, and the economy and access to credit had a larger effect than in the same month last year. Retailers also indicated that government action or inaction had a negative effect on demand, though less of one this year than in the past. The industry is waiting for Congress to develop and pass a tax-reform bill that President Donald Trump will sign. “The government needs [to] pass tax reform or [the] stock market will decline and negatively impact [the] wealth effect and sales,” one dealer said. The October survey asked dealers how the recent hurricanes and other weather events, such as droughts and floods, have affected sales growth this year. 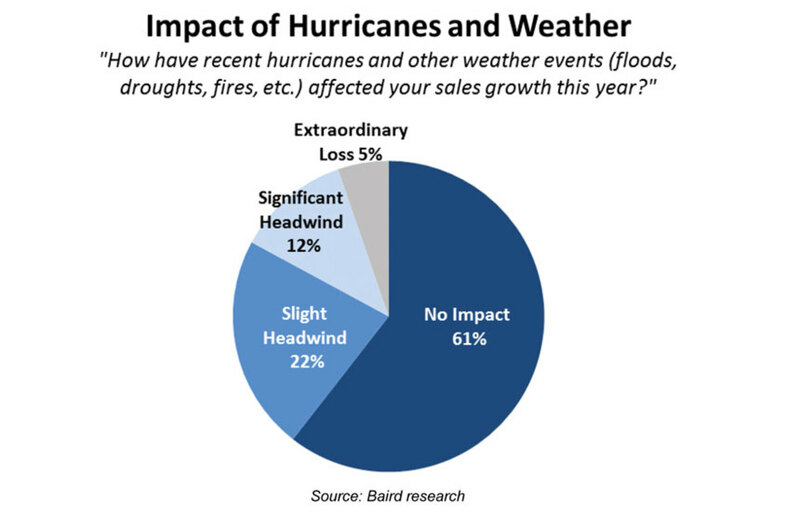 Fifty percent of the Florida dealers surveyed told Baird that Hurricane Irma caused a “significant headwind” on sales growth this year. “We completely bombed out in September, and [we’re] finally feeling that business is getting back to normal,” one dealer said.